What Causes Weakness and Dizziness After Walking on a Treadmill? 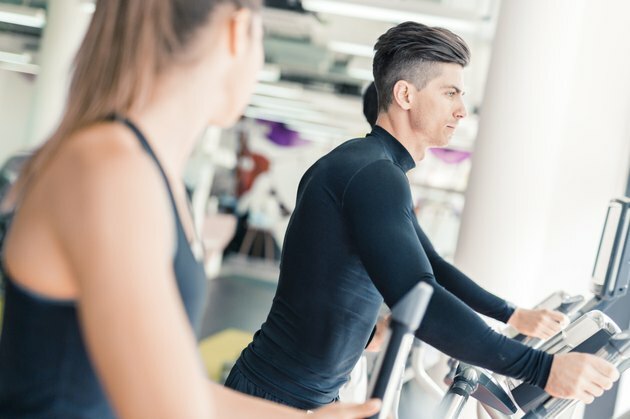 Ideally, walking on a treadmill should make you feel invigorated or maybe a bit tired, but feeling weak and dizzy is a sign something is wrong. Over-exerting on a treadmill by walking faster than you're able to, at too much of an incline or for too long can cause weakness and dizziness. The problem could be something as simple as not having enough food or water, but it could also be the result of a more serious medical disorder. If you find that you are experiencing the problem consistently, despite taking preventive steps, consult a doctor. If you have skipped a meal or not eaten enough, you won't have enough blood sugar, or glucose, for your brain to function properly, which can lead to weakness and dizziness. Exercise can exacerbate the condition because it requires more energy. In addition to feeling dizzy and weak, you may also experience irritability, headaches, trembling, anxiety and excessive sweating. Not having enough fluids in your body can produce similar effects. To remedy the problem, eat a full meal 2 to 4 hours before getting on the treadmill, or consume a small snack 30 minutes prior to exercising. Columbia University Health Services recommends drinking 16 ounces of liquid 2 hours before you get on the treadmill, and drinking plenty of water during and after exercise. If you exercise for more than 60 minutes, drink a beverage enhanced with electrolytes to help you hydrate more effectively. When you are engaged in exercise, your heart pumps faster to provide blood to your muscles. Your blood vessels expand to get rid of the excess heat generated. If you abruptly stop walking on the treadmill, your blood vessels are still expanded but your heart rate slows. This results in lowered blood pressure, which can lead to dizziness and feeling weak. To prevent this from happening, gradually decrease your pace over a period of a few minutes before stopping completely. Motion sickness is the result of your brain getting mixed signals from your body, inner ear and eyes. You may be particularly sensitive to getting motion sickness, or you may have an inner ear disorder that is causing the problem. While motion sickness is commonly associated with being in a moving vehicle, such as a boat or airplane, moving on a treadmill can have a similar effect. In addition to weakness and dizziness, you may also experience nausea, cold sweats, pale skin and increased salivation. To prevent motion sickness, focus on a stationary object in front of the treadmill while you are walking. Consult a doctor if the problem persists. A variety of underlying medical conditions can cause dizziness and fatigue. Most often, they have to do with the heart. Wearing a heart-rate monitor will let you know if you're keeping within your target heart-rate zone. But, if your heart is not working properly, you will not get a sufficient amount of blood to your brain, which can lead to weakness, fatigue, dizziness and nausea. Having high or low blood pressure can also lead to similar symptoms. Diabetes, metabolic disorders, brain diseases and certain medications, particularly blood thinners, can all lead to feeling weak and dizzy.